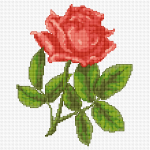 The rose has always carried a deep symbolic meaning and has been a favorite of many people.Use this pattern of a single red rose to send a message of love. 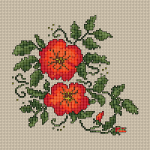 Group of beautiful flowers in red and orange designed for 14 count Cream Aida. Simple design of two decorative roses in pink frame.Suitable for cards making,biscornu and more. 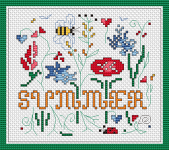 Summer-themed composition depicting stylized flowers and bees. Beautiful cyclamen flowers in pink and green. A small and easy design that looks best on a dark blue fabric. Beautiful single pink rose a symbolic representation pertaining to love and gratitude. Beautiful design of purple violet flowers.Giving a violet to a lover is a reflection of modest love and appreciation, and to send a violet to a friend shows love and admiration. 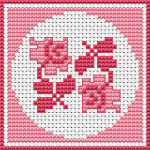 Bouquet of Crocuses whit a red ribbon counted cross stitch pattern. Small design of pink spring flower in a pot and two butterflies. 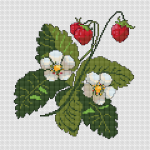 Beautiful pattern of a strawberry plant with aromatic fruits and flowers.